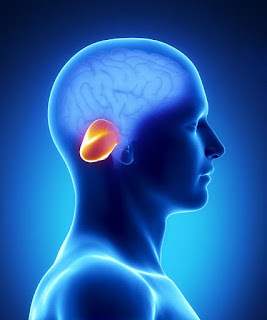 Cerebellar tonsils are the rounded bodies present at the base of cerebellar hemisphere. These tonsils run downwards from the base of the skull. The little protrusion of tonsils via foramen magnum is diagnosed as cerebellar tonsil ectopia. It is also called as chiari malformation at milder form. The increased pressure on cerebellar tonsils make them pass through foramen magnum in skull and as a result tonsillar herniation occur (other name of cerebellar tonsillar ectopia), which is a life-threatening condition. There are four types of cerebellar tonsillar ectopia reported, in which type 1 and type 2 are most commonly seen in patients. In type 1 the tonsils elongate and run downward from the base of skull via foramen magnum to the cervical spine C1 and C2. This elongation may block the flow of cerebral spinal fluid from the aperture of fourth ventricle. It is a congenital anomaly. The elongation of tonsils may be up to 5 mm. The normal position of cerebellar tonsils is 1 mm above the foramen magnum. Scientists reveal that if the length of tonsils below foramen magnum is 2 mm then the sensitivity will be 100% and specificity will be 98.5% in the effected patient. The patient with a condition named cerebellar tonsillar ectopia may have the following causes behind it. Any physical trauma due to accident or any other head injury leads to elongation of tonsils causing cerebellar tonsillar ectopia. Due to hematoma formation, the pressure in the cranium called intracranial pressure increases causing cerebellar tonsillar ectopia. It is also reported that the cerebellar tonsillar ectopia may be present but asymptomatic until there is a whiplash which makes it symptomatic. Internal head trauma is also responsible for cerebellar tonsillar ectopia. The increase in dural strain pulling causes cerebellar tonsillar ectopia. The following symptoms are associated with cerebellar tonsillar ectopia. Appearance of cerebellar tonsillar ectopia is from the adulthood i.e. from 20 to 50 years of age. The patient feels severe headache in full head along with pain in the neck region. While coughing, the aggravation occurs. Sneezing is also reported along with extension of head and neck region. Vision also get effected because that part contains nerves associated with vision. Weakness in upper and lower limbs occur in association with hydromyelia. Altered sensations might be a symptom. Age is another factor associated with cerebellar tonsillar ectopia. The most effective and only treatment for cerebellar tonsillar ectopia is the surgery. The surgery named sub occipital craniectomy is performed to decompress the elongated cerebellar tonsils. In this surgery, the back part of head i.e. the bony part is opened to remove tonsils. Along with sub occipital craniectomy, laminectomy is also performed for the C1 and C2 in order to decompress the cervical spinal cord. Dural grafting is also performed to increase the space, completing the procedure. The surgery may be performed under general anesthesia which lasts for 3 to 4 hours.